$7.99 cover price, 72 pages. 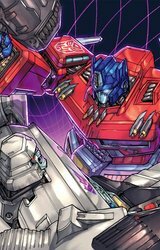 Publisher solicitation: Hearkening back to the great b&w comic book magazines of yesteryear, this debut magazine offers three classic tales from three different eras�spanning THE TRANSFORMERS' amazing run of over twenty years. This special 8-1/2" x 11" magazine format contains stories from the early Marvel days (issue #42, "People Power"), days to the Dreamwave (Generation 1, Vol. 3, #1) adventures to the all-new chapters of TRANSFORMERS lore from IDW (Stormbringer #1), all underneath a brand-new cover from artist Robby Musso (Transformers Spotlight: Ultra Magnus). This collection is a true treasure for long time fans as well as an excellent introduction for new fans. Publisher solicitation: Continuing with three tales that span THE TRANSFORMERS' twenty plus year reign, this special 8-1/2" x 11" magazine format collection contains an early Marvel story (issue #44, "The Cosmic Carnival"), the continuing Dreamwave run (Generation 1, Vol. 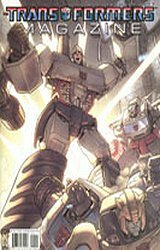 3, #2), and the latest contribution to TRANSFORMERS lore from IDW (Stormbringer #2). Artist Robby Musso (Transformers Spotlight: Ultra Magnus) provides another all-new stunning cover. 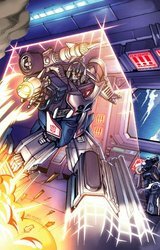 Publisher solicitation: Continuing with three tales that span THE TRANSFORMERS twenty plus year reign, this special full-color, 8-1/2" x 11" magazine format collection contains an early Marvel story (issue #56, "Back From The Dead"), the continuing Dreamwave run (Armada #3), and the latest contribution to TRANSFORMERS lore from IDW (Stormbringer #3). Artist Robby Musso (Transformers Spotlight: Ultra Magnus) provides a stunning new cover. 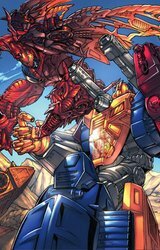 Publisher solicitation: Continuing with three tales that span THE TRANSFORMERS� 20- year reign, this special full-color, 8-1/2� x 11� magazine format collection contains an early Marvel story (issue #57, �Resurrection Gambit�), the continuing Dreamwave run (Armada #4), and the latest contribution to TRANSFORMERS lore from IDW (Stormbringer #4). Artist Robby Musso (Transformers Spotlight: Ultra Magnus) provides a stunning new cover.